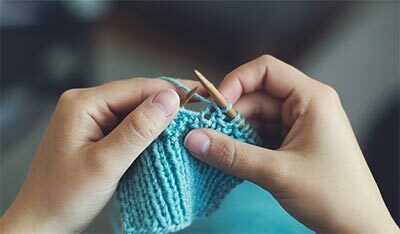 Progressions is a pattern line designed to help you to master basic knitting and crocheting techniques and complete a fun project at the same time. Throughout the patterns, there are helpful links to diagrams and instructions. If you have a question, simply click on the link. When you are finished, close the link and return to the pattern. The first series of Progressions patterns features this season's trendy cover up, the shrug. There are two knit versions and two crochet. Each highlights a different stitch pattern and introduces various methods of increasing, decreasing, joining seams, and the concept of gauge. Gauge is the measurement given at the beginning of all patterns. 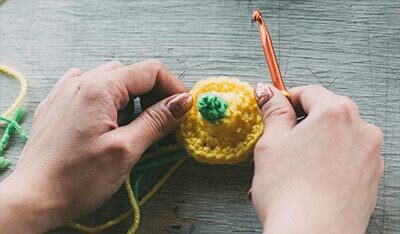 It tells you how many stitches and rows it will take to knit or crochet a 4" square using the yarn and needles or hooks listed in the pattern. It's important to match this gauge to ensure a properly sized garment or project. The needle and hook size given is a recommendation only. You may need to change the size, either up or down, in order to achieve the 4" square. What if the number of stitches and rows is different in your 4" swatch? If you have more stitches per 4" than the gauge, redo the swatch with a smaller needle or hook until you get the correct gauge. If you have fewer stitches per 4", redo the swatch with a larger needle or hook until you get the correct gauge. For Progressions patterns, we do not list a specific yarn. Instead we recommend a medium weight yarn (look for #4 on the label). The needle or hook sizes listed are generally used for medium weight yarns. We are not doing this to confuse you but to encourage you to select a medium weight yarn you find attractive. To illustrate the variety of yarn options possible, we have photographed four different versions of the Openwork Shrug at the top of this page. One version was knitted with a heavier weight yarn (#5) on the recommended needle sizes and the gauge was correct. Experiment with different yarns but use the pattern gauge as a guide. The shrug pattern is an ideal project with which to experiment for several reasons -- it is knitted or crocheted in one piece, there is minimal finishing, it is easy to wear, and relatively quick to make. Plus, these shrug patterns are easy to adjust. For instance, these basic shrug patterns are relatively snug and feature three-quarter length sleeves. If you want to make longer or shorter sleeves or make the back larger, adding or subtracting rows is easy. Learning these additional techniques will open up even more project possibilities in your future!